Industry start-up Bookee has been awarded the ‘Brightest Minds Showcase’ at the 2016 iGaming Entrepreneur Conference (8 December Grange Hotel London). Pitching to a panel of industry experts, Bookee which describes itself as the ‘Tinder for betting app’ won the contest ahead of 12 rivals competing for the top prize of a ‘mentoring and professional’ services package worth more than £25,000. 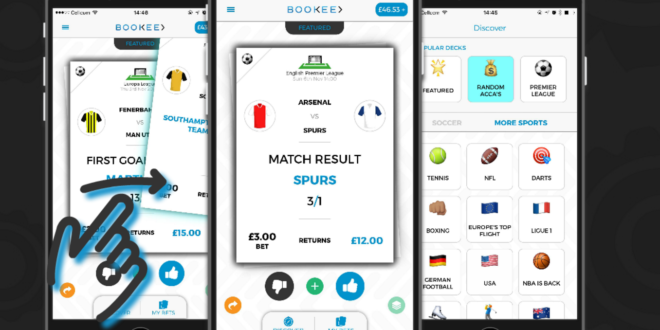 The Bookee app offers users a randomised ‘deck’ of suggested small-stake personally-selected bets on a range of sports, giving them the opportunity to swipe either left to discard or right to accept the bet. The start-up was founded by former school friends Adam Kalmanson, previously with William Hill, and Adam Wilson, once of 888, with the mission statement of creating a personalised and social platform for the recreational gambler. Since its inception, Bookee has raised a pre-seed round from leaders in the gaming industry, launched in beta with hundreds of paying users and is now looking to raise a seed round to “commercialise and truly disrupt the B2C betting space”. The start-up states that during testing over the course of the Euro 2016 football tournament last summer, Bookee’s margin was found to be well above industry average. On winning the ‘Brightest Minds Showcase’ a delighted Kalmanson commented: “We are delighted to have won the Bright Minds Showcase at this year’s iGaming Entrepreneurs Conference. We’d like to wish all our fellow start-ups the best of luck in 2017, and look forward to sharing more awesome features in Bookee in the coming months. Next Bettingpro – Festive Thinking…getting serious about SPOTY 2016.